Counting cards is the single most iconic advantage gambling practice. When you think of professional gambling, you probably think of card counting. 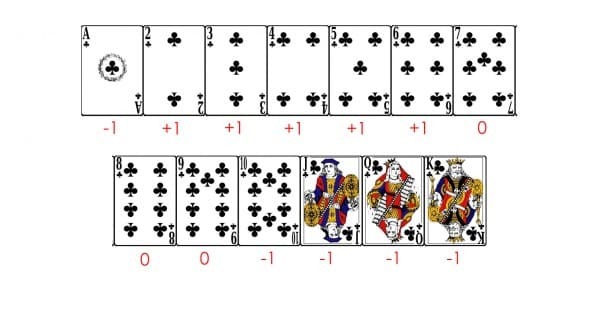 The mathematical method of counting cards was made popular by the MIT Blackjack team and by mathematician, best-selling author and Blackjack hall of fame member Dr. Edward O. Thorp. In this guide you will find everything you need to get started with counting cards – from the basics to tutorials, both written and video. Where to practice counting cards? Counting cards, an overview – Card counting as we know it today is attributed to mathematician Dr. Edward O. Thorp, who published the New York times best seller “Beat the Dealer” in 1966. In the 1960s, he regularly made $ 50,000 ( value as of 2014: $ 396,000) gambling counting cards each weekend, till he got banned from most casinos. The popularity of card counting in Blackjack received a large boost from the M.I.T Blackjack team and the movie “21” in recent years. Card counting is most often used while playing Blackjack and Baccarat but theoretically, it can be used while playing other card games. Counting cards is the most popular advantage gambling method. Card counting is based on statistics and probability. In Blackjack and baccarat (where it is most often used) there are sets of cards in the game, which benefit the player more, and there are sets of cards, which benefit the dealer more. When you’re counting cards, what you are really doing is keeping track of cards already in the game and trying to figure out how the probability of cards – which benefit the player more – change as the game progresses and adjusting your strategy accordingly. It would be impossible to cover all these in one post, but Hi-lo card couting strategy is the most popular of all card counting schemes and it is also arguably the best, overall. I recommend using the Hi-Lo card counting strategy and in this guide I will explain the basics of it. In Blackjack, high cards (especially aces and 10s) benefit the player more than the dealer, while low cards, (4s, 5s, and 6s) benefit the dealer more. A high concentration of aces and 10s in the deck increases the player’s chances of hitting a natural Blackjack, which pays out 3:2. Also, when the shoe has a high concentration of 10s, players have a better chance of winning when doubling. Low cards benefit the dealer, since according to Blackjack rules the dealer must hit stiff hands (12-16 total) while the player has the option to hit or stand. Thus a dealer holding (12-16) will bust every time if the next card drawn is a 10 /making this card essential to track when card counting/. Cards worth 10 have a value of -1. Aces also have a value of -1. Cards 7-9 have no value. Start at 0 and as each card comes up, add it to your tally. Increase your bets when the count is running positive (that is, about +2 and above). The higher the count, the more you should bet. And this is how you count cards. There are many different systems, variations of the basic system out there but this is the most common form. It sounds easy on paper but it must be noted, that it takes months of practice before you can apply it flawlessly online (in live dealer casinos) and it is especially hard to do in brick and mortar casinos with all the distractions. Card counting has a few advantages and disadvantages when compared to other advantage gambling methods. 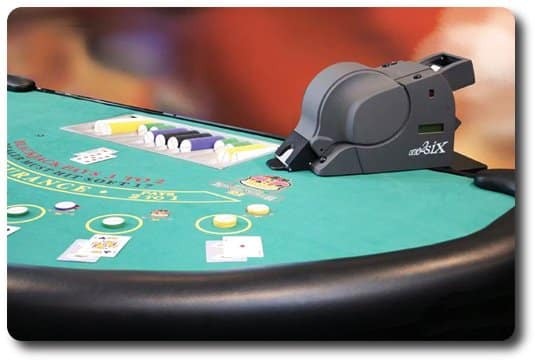 Continuous Shuffling Machines (CSMs, here is a picture of one) allow dealers to return the cards played to a single shoe, which makes it possible for cards that were just played on the table to be re-shuffled to the top of the shoe. This makes all card counting schemes useless. There is one thing that seriously limits the money you can make with card counting: you can get banned from a casino. Even tough card counting is not illegal, casinos have the right to ban you from playing if you are counting cards. Therefore I would suggest playing it safe and not to win more than $ 2 – 3 000 in one sitting. Make sure you lose some money as well and don’t just win, because that can make it quite obvious that you’re counting cards. Casinos employ sophisticated methods to detect players counting cards. You can still use card counting in this case, but make sure you don’t go overboard. It is important to mimic the natural pattern of gaming as close as possible. This makes counting cards harder, because you not only have to be an expert player and a flawless card counter, you also need to be able to view the whole process from the dealer’s perspective. If you play it safe and you play in different casinos all the time, you can make as much as $ 50 000 – 100 000 monthly, but anything higher than that might draw suspicion. If you don’t go overboard you can certainly make a living doing this for a time. You will eventually be banned from most casinos but it will take years-and-years before that happens. The Hi-Lo count was first introduced in 1963 by Harvey Dubner, an American engineer and mathematician. Below is a brief explanation of how to use the Hi-Lo system in practice. II., Start with a “running count” of zero at the start of the deck/shoe. As cards are revealed, keep adding or subtracting from the running count, according to the point system in step 1. For example, if the first ten cards to come out of the shoe are 2, 7, Q, 7, K, A, 8, 3, 2, 5, then the running count is: +1+0-1+0-1-1+0+1+1+1=+1. E.g. : running count is +5 and there are about 2 decks left. The true count would be 5/2 = 2.5. Let’s round that up to 3, to keep it simple. This is the true count. IV., The higher the value of the true count, the more you should bet. Only increasing bets after a win, decreasing after a loss, and staying the same after a push makes play look more natural, but at a cost of more moderate profitability. Try mimic the natural pattern of the game as close as possible, so no one can find out that you’re counting cards. If you have read the Hi-Lo card counting tutorial and watched the video, you only need to practice to master the Hi-Lo card counting strategy in Blackjack and start winning money. If you are new to counting cards, or you are just starting to get the hang of it, you need to practice in an environment that has less distractions than a brick & mortar casino. The best place to practice card counting is a so called “live casino” (online casino with live dealers). If you are looking for places to practice card counting, check out these live dealer casinos. Wanna try counting cards? BGO offers live dealer casinos where you can practice the method! 32 Red casino – offering live dealer Blackjack – you can practice counting cards! CSM (Continuous Shuffling Machines) make card counting impossible (live casinos have CSM sometimes too). Remember, counting cards is not illegal, but it can get you banned from a casino (or online casino). The higher the count, the more you should bet, but keep in mind that if you range your bets too much, you might draw the suspicion of the casino staff. Subtlety is important. Everything you need to know about counting cards; card counting tutorial, guide, videos and more. Counting cards using the Hi-Lo card counting strategy.